Where else should we count bike numbers? 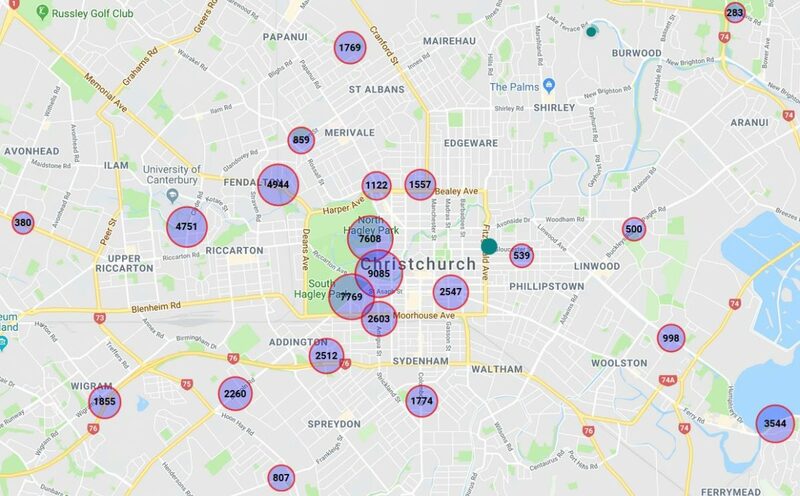 We’re now starting to develop a comprehensive set of automated cycle counters around the city, and you can check out the weekly count data live at SmartView, the City Council’s very useful information website. Of course, these counters don’t even come close to capturing all of the cycle trips around the city; on my typical 6 km commute to work I don’t trigger any of the 20-odd current counters. 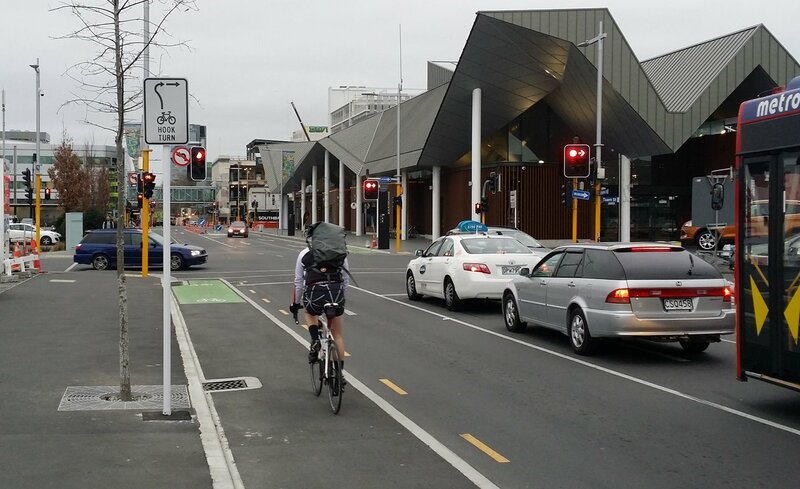 How many people cycle near the bus interchange? Obviously any list of potential sites is still going to miss a whole lot of other cycling locations; all you can do is try to get a good representative sample to help monitor ongoing trends across the city. Unfortunately there is a cost associated with installing (and monitoring/maintaining) each site, so that will always be a constraint on the available number of installations. The other thing that’s a little annoying is the fact that many of the on-street counters are only one-way – in SmartView, click on individual counters to find out whether they pick up movements in one or two directions. Ideally it would be useful to know the two-way flows; it would make the numbers look even more impressive for a start and would save us having to manually double the numbers shown. At the very least, it would be helpful if the one-way counts were displayed using a different symbol or colour to the two-way sites, for easy identification. Where do you think some cycle counters should be located? What about along Pages Rd towards Eastside. Definitely agree that there are some big gaps in the counter network. Joe, if you control a domain name, add a CNAME that resolves to that AWS mess. Much nicer. Give me a yell directly if you want a hand with this. I would like to see daily count information on smartview (if it is technically possible – I imagine it is). A 7 day total hides quite a lot of interesting information. Hey Joe, I didn’t see this post till today. I had plans to add more granular data to cycle counters but haven’t got to it till now. I added daily data (for last 30days). Just please be nice to smartview server when you will be downloading the data (you obviously know how), it is not really ready for mass script downloads. What about the intersections of Riccarton Ave/Deans Ave and Fendalton Rd/Harper Ave as I see a lot of cyclists coming through there into Hagely park. Also at Matai St/Deans Ave where the cycle way feeds into Hagley Park, again a lot of cyclists coming through that way. I’m happy with the locations – but I wish CCC could make the detailed count data easier to access. 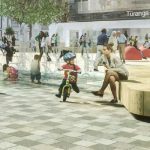 Auckland publish tables of the raw data every month (https://at.govt.nz/media/1978292/sept2018akldcyclecounterdata.csv), it would be useful to have that here. Slightly off topic – but I notice the Antigua Boatshed Bridge has the highest number of cyclists of the areas currently monitored. I’ve cycled this bridge commuting to/from work for 10+ years now. Back in the “good old days” when the bridge surface was slippery timber, there were raised kerb footpaths each side designated for pedestrians with the central lane designated for cyclists. These were usually routinely ignored – but at least there was a token effort. After the repair work & with the new asphalt surfacing, all there is now is the shared pedestrian/cyclist symbol. I always watch my speed on the bridge but have still had a few close calls with pedestrians changing course unexpectedly, seemingly oblivious as to what the dinging bell noise approaching them from behind might mean. I wonder with all the other roadworks to Hospital Corner adjacent still in progress whether this might also get addressed and some sort of lane markings reinstated? I really wish the council would improve the Carlton Mill bridge, so it would be good to get some stats on bike/foot traffic on it. Not only is it a major ‘gateway’ to the CBD, it is dangerously narrow for both pedestrian and bikes. A lot of school cyclists going to Boys and Girls High Schools use it, plus it feeds into the Uni-Cycle route from H Park. You see cyclists using the footpath on the bridge – which is narrow and dangerous, esp. when there are pedestrians – and whenever there is a big event at H. Park, it turns into a total zoo. An extension that is a shared cycle and pedestrian bridge would be great. The challenge with the Carlton Mill Bridge is that it has heritage designation. So you can’t just plonk some clip-on onto the side of it (right where the ornate bridgework is). I gather that the long-term plan is to build a separate foot/cycle bridge just south of it, thus also freeing up the main bridge width to add a separate right-turn lane into Park Tce. There’s one chap here at work who commutes over Rapaki and Bridle paths… he’s multimodal and uses the Diamond Harbour ferry to get home. So not 100% of rapaki riders are recreational. I’d expect to see more sensors on the Southern and Northern motorway bike lanes. Given they’re still being built its the perfect chance to put in a separate lane counter for each lane, along with speed sensors and so on. I’m seriously interested in anything that makes my work commute less deathly – Jones Road is horrid but is still better than other options like Shands road or SH1. No, I doubt it, the Eco-Counters are looking for a certain “signature” in the detection signal that they recognise as a bike. Other things like scooters, skateboards, prams, etc tend to have different signatures. I pass within 20m of 3 counters on my commute, but cross over none of them. I could detour a little and get the count, but that’s not my first thought when cycling to work or home. Perhaps count bikes on buses, where they travel from and to. There have been a number of collisions along the motorways so some of us avoid the cycle paths next to motorways and crossing busy roads/major intersections. So placing the bikes on buses gives the ability to access safer cycleways..If there were safer cycleways in areas closer to home (like there were before the quakes).. I’m sure there would be more cycling in those areas. At the moment cycling trips by locals are counted in other areas and where thats not possible trips are made using other vehicles. In the meantime its great to see the improvements around the city and they’ve had to start somewhere. Build them and we will use them.